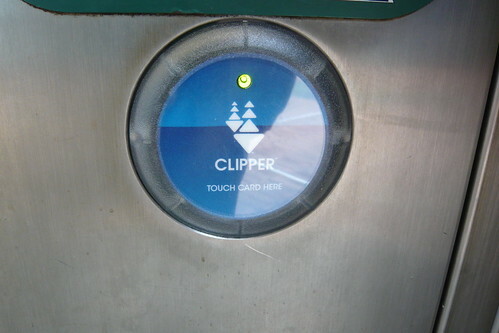 SF Appeal this morning reports that all the ticket machines in every BART station now include Clipper functionality. I’ve been seeing those little RFID medallions on the machines for a few months now. I guess they’re all operational. If they work better than the transponders on turnstiles and Muni vehicles, this is a good thing. Or? It wasn’t too long ago that BART insisted they would never do this because it wasn’t cost effective. Shortly thereafter (or it could’ve been the other way around) someone discovered that you could ride anywhere in the BART system on Clipper for less than full fare. I suppose losing thousands of dollars every day made Clipper integration miraculously affordable. Unless you’re buying a Fast Pass, the BART Clipper readers are much easier to use than the Muni ones. Wave your card, add your money, wave your card again, done. No buttons to push, no menus to navigate, and a $2 instead of $5 minimum. Even saw a Muni Metro booth minder wave a tourist over to the BART machines instead of getting up and explaining how theirs work.